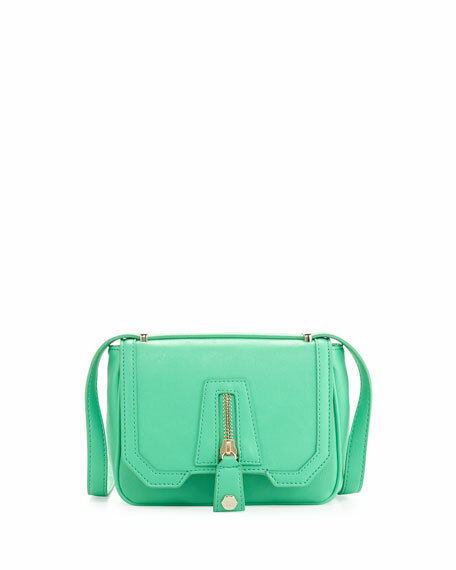 This small Cari crossbody bag from Danielle Nicole has big impact with an oversized zipper detail and bold mint color. Danielle Nicole mint crossbody bag with golden hardware. Magnetic snap-front flap with oversized zipper embellishment. Inside, zip pocket and card slots. 5 3/4"H x 8 1/2"W x 3"D.
Handbag designer Danielle Nicole DiFerdinando's passion for design began at a very young age. This passion carried Danielle through the doors of Fashion Institute of Technology and later to study in Europe, where she became transfixed by the design and manufacturing prowess of the major design houses. Danielle's collection of luxury handbagscharacterized by Italian lambskin, crushed patent leather, and French embroidery fabricsets her apart from other contemporary handbag designers, providing her clients with a fresh twist on classic styles.